He suggests, rather, that the financial sector’s gains have been more in the form of economic rents — basically something for nothing — than the return to greater economic value. “The rising share of income going to financial assets also contributes to labor’s falling share. 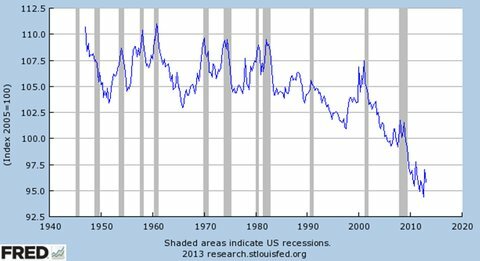 As illustrated in the following chart from the Federal Reserve Bank of St. Louis, that share has fallen 12 percentage points since its recent peak in early 2001 and even more from its historical level from the 1950s through the 1970s. The falling labor share results from various factors, including globalization, technology and institutional factors like declining unionization. But according to a new report from the International Labor Organization, a United Nations agency, financialization is by far the largest contributor in developed economies (see Page 52). The report estimates that 46 percent of labor’s falling share resulted from financialization, 19 percent from globalization, 10 percent from technological change and 25 percent from institutional factors. “Among those pointing their fingers at financialization is David Stockman, former director of the Office of Management and Budget, who followed his government service with a long career in finance at Salomon Brothers and elsewhere. Writing in The New York Times, he recently said financialization was “corrosive” and had turned the economy into “a giant casino” where banks skim an oversize share of profits. “Commoditization” has led to food price volatility and food insecurity in the developing world. It also perpetuated the housing bubble–while it is true that mortgages were always financial products, the way the mortgage backed securities grouped mortgages together turned a practice that was once a means of saving into an opportunity for people to use the equity in their homes like credit cards. When the housing bubble burst, many people found their mortgages “under water”. While there is certainly an element of personal responsibility, the scope of the housing crisis was certainly deepened due to “financialization” and “commoditization”. Financialization attracts the best and brightest away from other non-financial fields. When all these talented people are working in a saturated market (such as more traditional investments), a natural effect will be the creation of “innovative” financial products–“commoditization”. While commoditization creates short run value by making products more liquid, in the long run it leads to price volatility and bubbles. Financialization has led to greater income inequality (as the vast majority of capital gains go to the ultra-wealthy), and diverts resources and man-power away from non-financial industries (the “real economy) due to higher fees paid to financial services (these resources could go to, say, MORE HIRING). It has also perpetuated destabilizing, high-speed, arbitrage-seeking investment. It is interesting that Mr. Bartlett says that it is unclear what public policies should be used to correct for this misalignment of resources. The answers are there (and Bruce himself has mentioned some in previous posts), the problem is implementation, as the proper policy responses require transparency and international cooperation and coordination (due to the global nature of capital in the digital age in order to prevent “capital flight”). Therefore, these commitments are rife with incentives to cheat (“prisoner’s dilemma”) which makes it much harder to come to binding agreements. One appropriate response is a financial transaction tax (FTT). Such a tax would deter short-run destabilizing trades that have accompanied “financialization” and “commoditization” and direct investments into more long-run wealth creating endeavors (think venture capitalism as opposed to high-speed trading). This would also temper the price volatility effect of “commoditization”. Another appropriate response would be to have a global standard tax rate for short-run capital gains. By setting such a rate higher than regular income taxation, resources would be diverted away the financial sector and back into the real sector (are you seeing a theme here?). Financial bubbles would be less prevalent, as people would be more likely to hold their income in safer assets / reinvest it in non-financial assets. Due to the relative ease of making short-term capital gains, and differences in national income tax rates, a global short-term capital gains tax rate of 50% seems like a good baseline to start from. Long-term capital gains should be taxed like ordinary income, not at lower preferential rates. “Financialization” and “commoditization” have had adverse effects on our real economy. The brightest people and an increasing share of national output have been diverted towards (generally) unproductive activities In the short run this leads to economic growth. 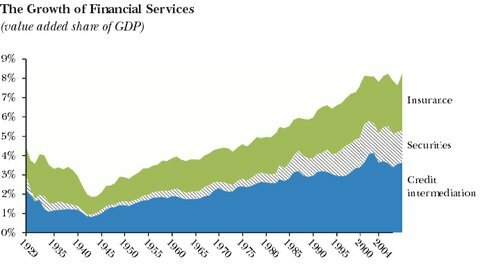 But this growth in unsustainable; in the long run crises occur when these bubbles burst, which have adverse effects that reach far beyond the financial sector (due in part to “commoditization”). Because public policies have allowed financial institutions to grow so powerful, the were able to become “too big to fail“, necessitating tax-payer backed bailouts. It is a good sign that economists are scrutinizing these practices. If it can be proved that not only do these practices lead to crises, but also have adverse effects on growth, employment, consumption and equality during “good” times, then it will be much harder for politicians around the world to resist the call for greater financial industry accountability via higher taxation (despite the threats from vested interests; if global standards are established, the 0.1% are welcome to setup the Mars Stock Exchange is they so desire). Categories: Economic Outlook, Welcome | Tags: arbitrage, bailout, bubbles, commoditization, financial sector, financial transaction tax, financialization, high speed trading, housing bubble, income inequality, inequality, real economy, too big to fail | Permalink. Yesterday a friend of mine, Adam Blejer, pointed me towards an HBO documentary, “American Winter”. He thought, rightfully so, that the message conveyed in the documentary was one that I may be interested in and have some insight on. Always eager to learn from my followers and get them involved, I looked into the documentary. I should say now that I was unable to actually watch the documentary, as I do not have HBO on demand. What I was able to do was read the summary of the documentary by the producer, which can be found here. This actually helped me analyze the documentary more clearly for two reasons. One, I have the meat and potatoes of the documentary spelled out in front of me, I did not have to watch and take notes or worry about missing anything, it is all there for me to go back and check on. Second, I was able to see the underlying argument without getting emotionally wrapped up in the struggles of the people in the documentary. This would have made an unbiased critique difficult if not impossible. The first thing I analyzed was any message conveyed based on economic indicators. In the first paragraph, I saw something that could not look right. “Yet 46% of this country is living in poverty, or near poverty, and today we have the highest number of poor since we began keeping records.” This is a slight of word, as the official U.S. poverty rate as of 2011 was 15%–31% of that 46% may be living “near poverty”, but are not actually living in poverty. One has to be careful, as poverty rates are based on a benchmark rate; set that rate too high and everyone is in poverty, set that rate too low and some people who are truly struggling to survive will not be counted. The census bureau is very transparent about how they find their numbers; an explanation can be found here. I will leave it up to you to determine whether the numbers are too high or too low, but that 46% was an obvious shock value number—many of those 31% living “near poverty” have much much more than even the “wealthy” in less developed countries. The Gini coefficient ranges from 0-1; the closer to 0 the more equally a countries income is distributed.The .45 number checks out, although it is significant lower once you account for taxes and transfers. There are structural issues that have lead to this inequality; low investment in social programs, preferential tax rates on capital gains and other subsidies which disproportionately go to the wealthy, and the decline of union power are all common examples. However, there are notorious shortcomings for comparing Gini coefficients between countries. For one thing, the same Gini coefficient for two countries can mean different things. Whenever you aggregate numbers, information gets lost in that aggregation. Also, in some countries such as China and India, the most impoverished experience “extreme poverty”. While relative poverty of course exists everywhere, extreme poverty exists only in the developing world. For these reasons, it is irresponsible to say “The Gini coefficient…is accepted as a fair method to compare income inequality in different countries.” This is far from a consensus amongst academics and policy makers. Next I examined the ethical argument over the welfare state, the “makers vs. takers” argument if you will. Paul Krugman has done a great job of highlighting how transfer programs tend to amount to inter-generational consumption smoothing; you borrow when you’re young, work and contribute when you’re in the prime of your life, and then retire and take from the system again. This formula has underpinned political economy and tax philosophy for decades if not centuries, and it works. In fact, there is really no alternative that works remotely as well in creating the opportunity for social mobility. This is a problem I tend to have with documentaries, is that they cherry pick information. Certainly some people who need help actually need it temporarily to help them get back on their feet. But you can be equally certain that there are some lazy people who rely on handouts their whole lives, people who “game the system”. It is because people see the world as black and white that it is so hard to work on reforms that can strengthen the welfare state and make it work more effectively. This is why politicians talk past each other, instead of deliberating and debating in order to come to reasonable compromises that work for the American people. “Studies show that it is cheaper to help families before they become homeless. And it is cheaper to help families before the kids are traumatized by living with food and housing insecurity, because those kids don’t do as well in school and they are more likely to wind up on drugs or in the prison system. Those costs to society will affect all of us for ten, twenty, thirty years to come. Yet even though it is cheaper to help families, to get them to a place where they are stable and productive, we seem to turn a blind eye and tell these families that they are on their own. I have written about poverty traps many times here at NN, just search poverty traps in the search bar and you will see in how many different contexts poverty traps exist. I fully agree that it is cheaper and more effective to attack the root causes of poverty before they become a problem. I do not know the methodology the filmmakers use to come to their conclusion, but it fits into a general philosophy I have on the subject; that any money saved in the short run by cutting social programs will be dwarfed by increased future spending in the welfare and penal systems. So while some of the figures and concepts the documentary pronounces may be a bit stretched (as is common with documentaries, as they are meant to have shock value), the overall message is one that I cannot (and do not wish to( refute. Income inequality is too high in America, and it is this way due to structural flaws in our fiscal and tax policies. Sequestration and other short term budget cuts are like putting a Band-Aid on a gunshot wound, it may stop the bleeding for a little but in the long run the problem will be worse. Capital gains taxes remain too low, even as they have risen from 15 to 20% following the “fiscal cliff” deal. Joseph Stiglitz explains quite eloquently how this perpetuates financial bubbles and takes talent away from more sustainable fields (such as medicine, teaching, manufacturing; basically anything not associated with capital gains). Meanwhile, no meaningful financial reform has taken place since the financial crisis. The same concept of “securitization” is beginning to rear its ugly head again. We must learn as a country from our past failures, and demand our elected officials enact policies that our in our best interests as a nation (I have often said that the only special interest group Congress should be worried about is the American people). It is the job of the American people to hold their elected officials accountable, and vote for the politicians that support the policies that we as a nation know are right (or at least vote against politicians who support policies that have been tried and failed). Categories: Blog Posts, Economic Outlook | Tags: American Winter, documentary, FIscal cliff, Fiscal policy, gini, HBO, income inequality, normative narratives, Poverty trap, sequester, social mobility, social safety net, social spending, tax policy, tax reform | Permalink.